Pepto-Bismol etc. (bismuth subsalicylate) is an antacid and antidiarrheal medication that contains non-aspirin salicylates. 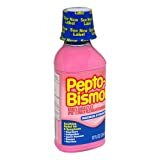 Pepto-Bismol etc. 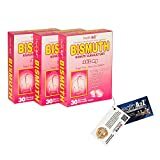 (bismuth subsalicylate) is available in liquid, tablet, and caplet form and is sometimes used by vets to treat dogs with diarrhea or Helicobacter infections.